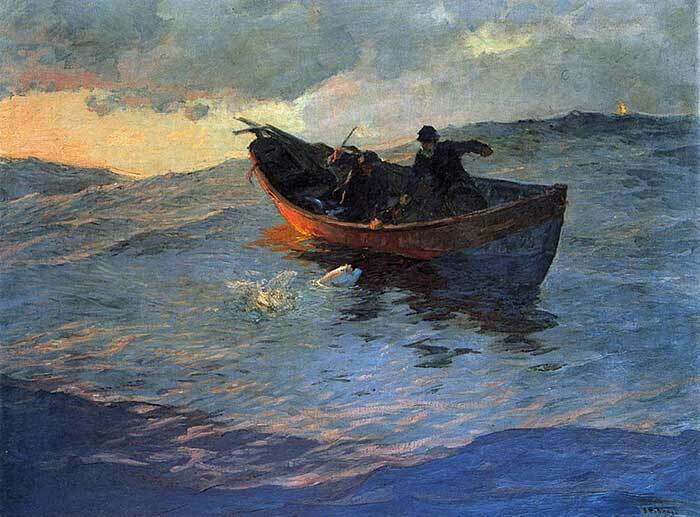 Willard Leroy Metcalf (July 1, 1858 – March 9, 1925) was a prominent American painter known for his beautiful impressionist landscapes. 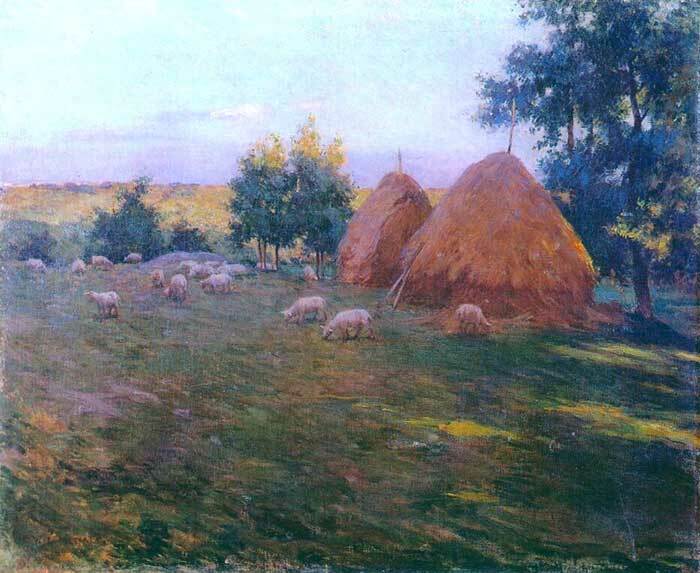 He initially started with portraits and illustration, during which time he would have developed his accuracy and drawing ability, but it was his landscapes which brought him to fame. 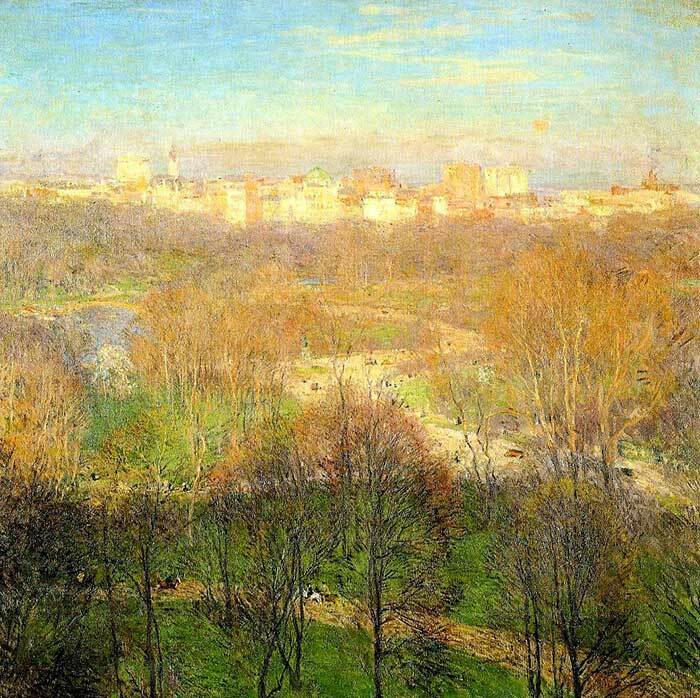 Willard Metcalf was a member of a group of artists known as The Ten American Painters (or The Ten). The group is pictured above. 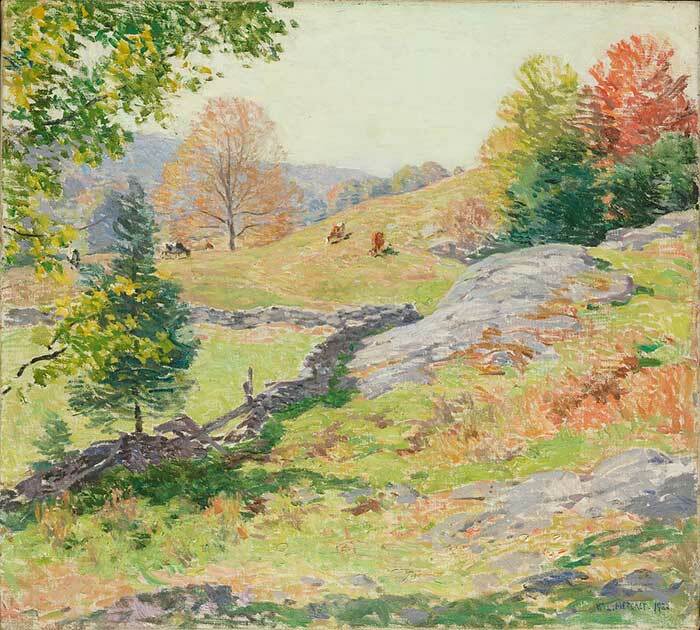 Seated, left to right: Edward Simmons, Willard Metcalf, Childe Hassam, J. Alden Weir, Robert Reid Standing. 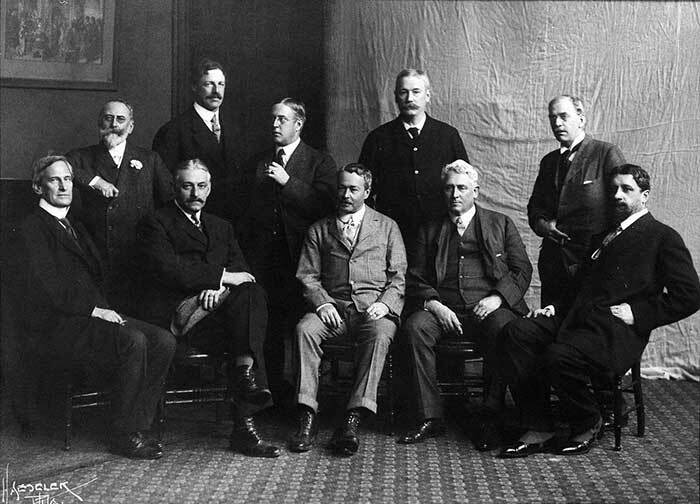 Standing, left to right: William Merritt Chase, Frank W. Benson, Edmund C. Tarbell, Thomas Wilmer Dewing, Joseph DeCamp. 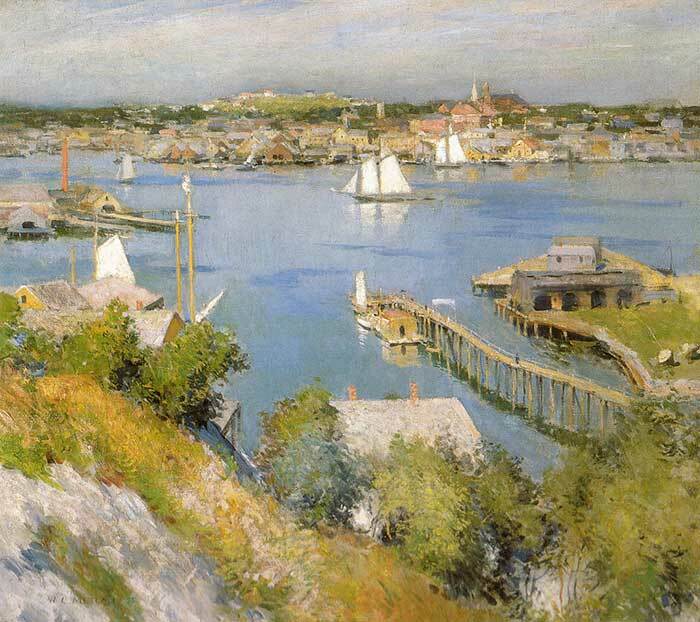 As you can see, there were some very prominent members in this group, such as Childe Hassam, Julian Alden Weir and of course Willard Metcalf. 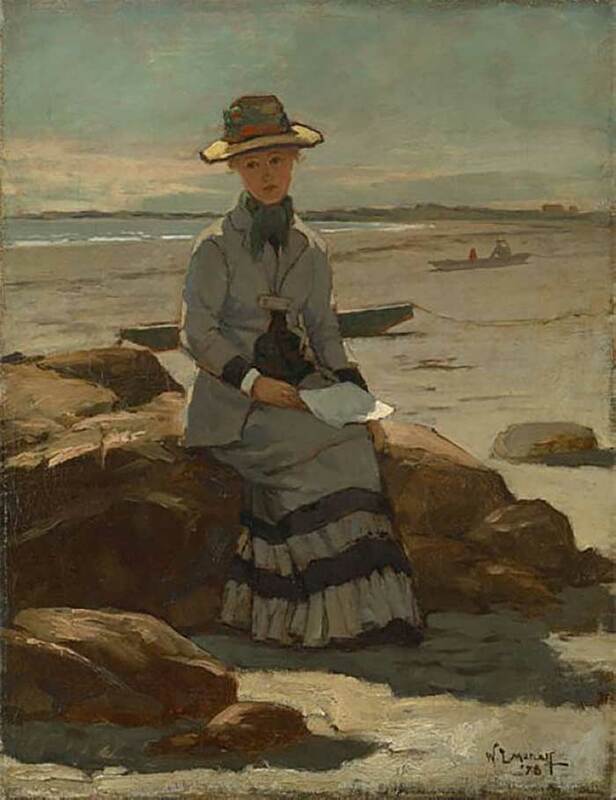 Winslow Homer was also invited to the group but declined. He is generally considered an impressionist but in my opinion his style seems to be somewhere between impressionism and realism. 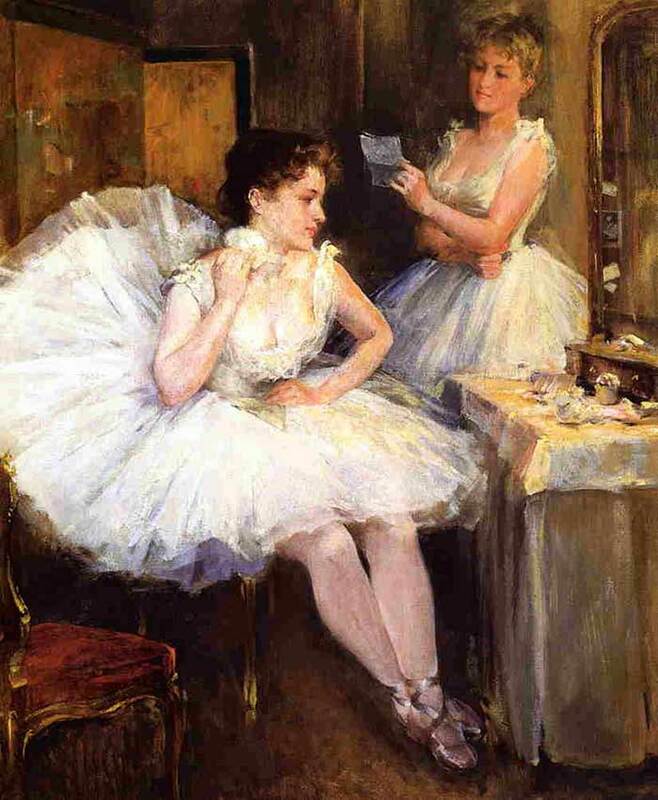 His paintings are much more delicate and refined than paintings by some of the other famous impressionists. 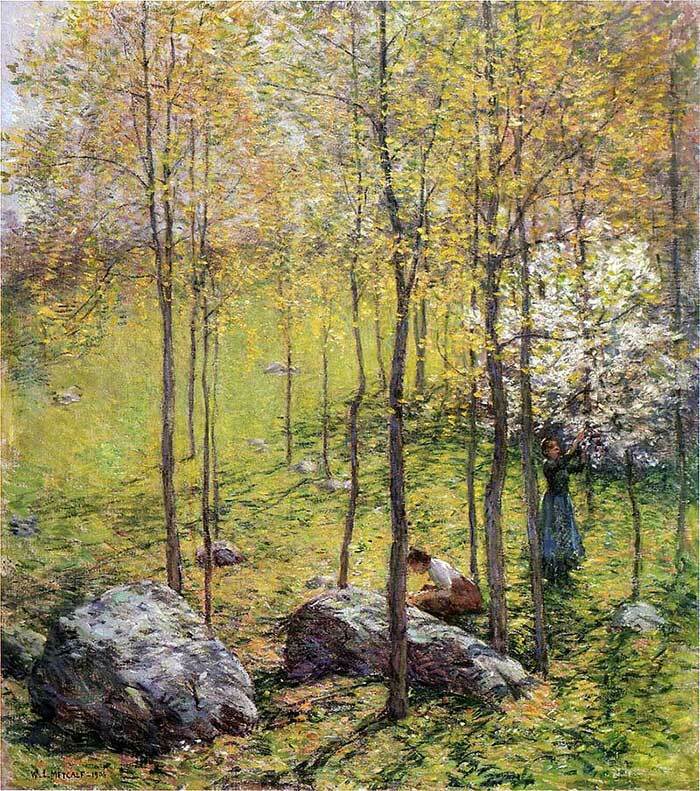 But there is certainly an element of impressionism in his paintings. None of his paintings appear overly tight or refined. Yet, they do not appear sloppy or unrealistic either. The paintings have an almost effortless beauty to them. 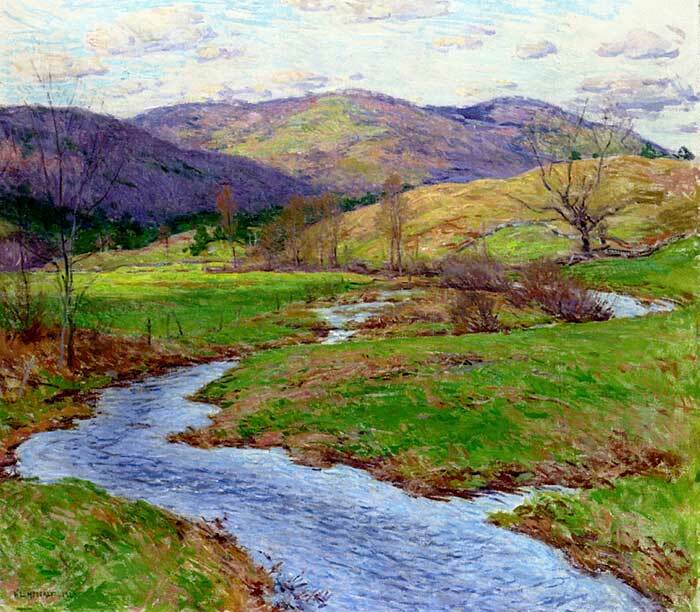 Part of the reason for this is Metcalf's fluid and confident brushwork. 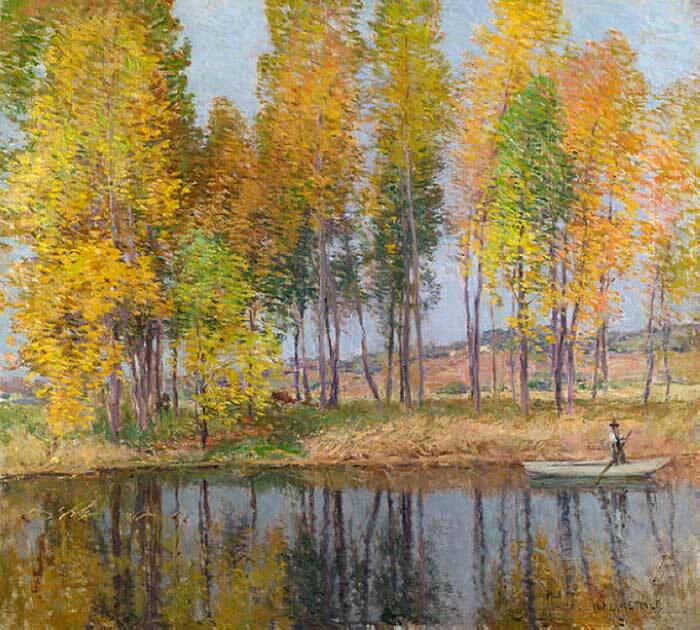 He did not overwork his paintings, but rather left most of his brushwork clearly visible. 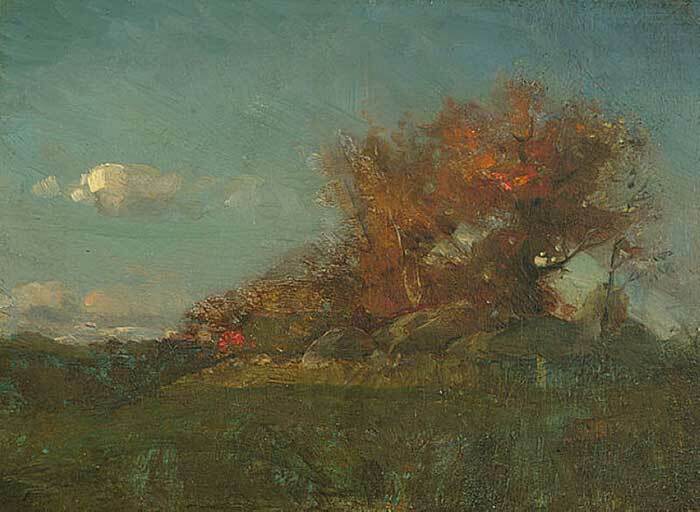 The painting below demonstrates some of his fluid brushwork. Also, notice those bold dabs of vivid orange and red which command your attention towards the center of the painting. "They'll sell you thousands of greens. Veronese green and emerald green and cadmium green and any sort of green you like, but that particular green, never." I wrote more about mixing greens here. 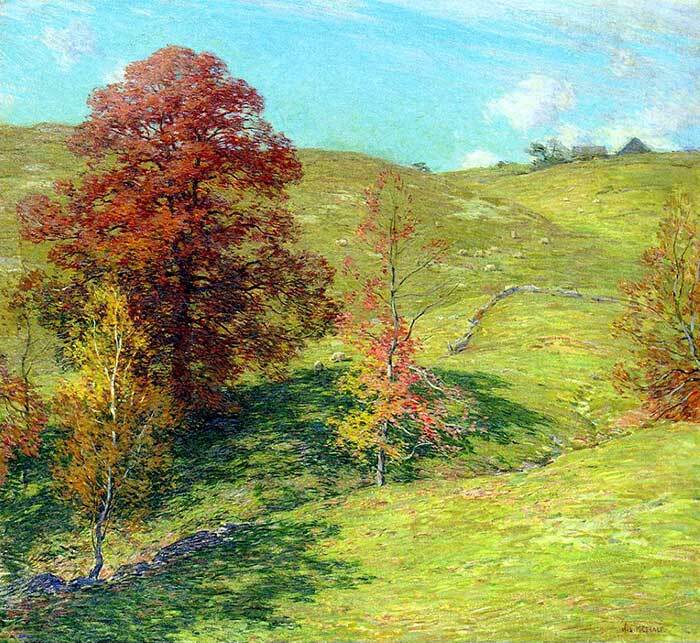 Willard Metcalf demonstrates in the following paintings just how to use green. There are all kinds of greens in these paintings - vivid greens, tinted greens and some subtle greens. But there are no greens which appear out of place. 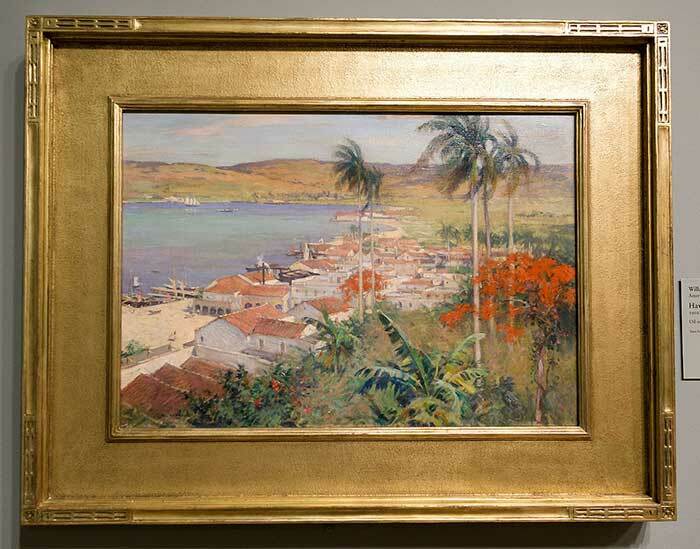 I also particularly like his use of that vivid green in the painting directly below. 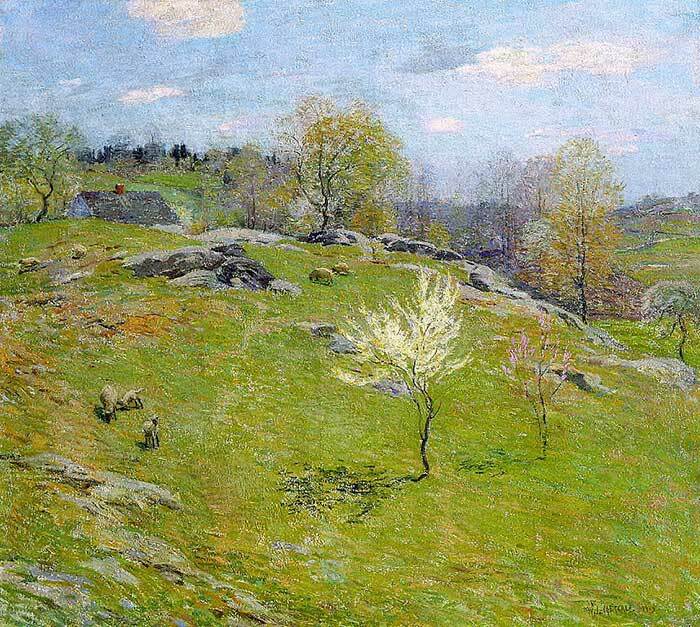 It is difficult to get away with using such a vivid green in landscape painting, but he pulls it off well. 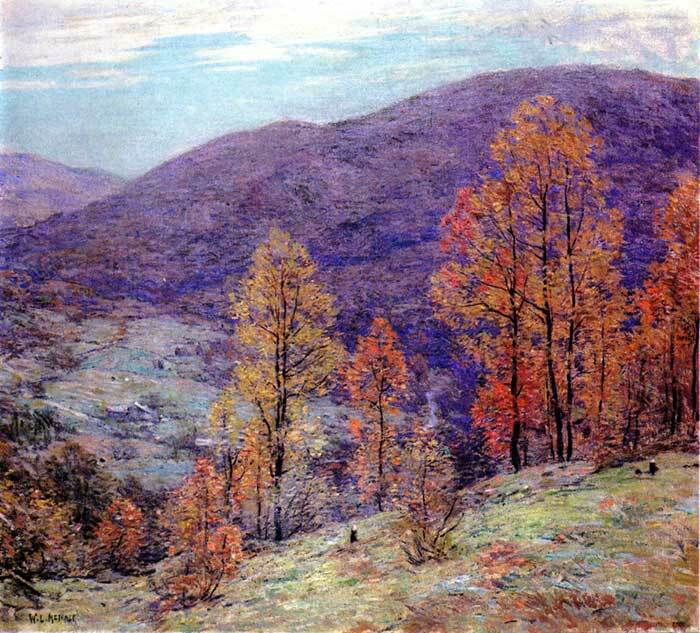 I hope you enjoyed these paintings by Willard Metcalf as much as I have. There is much to learn from his fluid brushwork and use of color. If you have a favorite painting, please let me know in the comments. 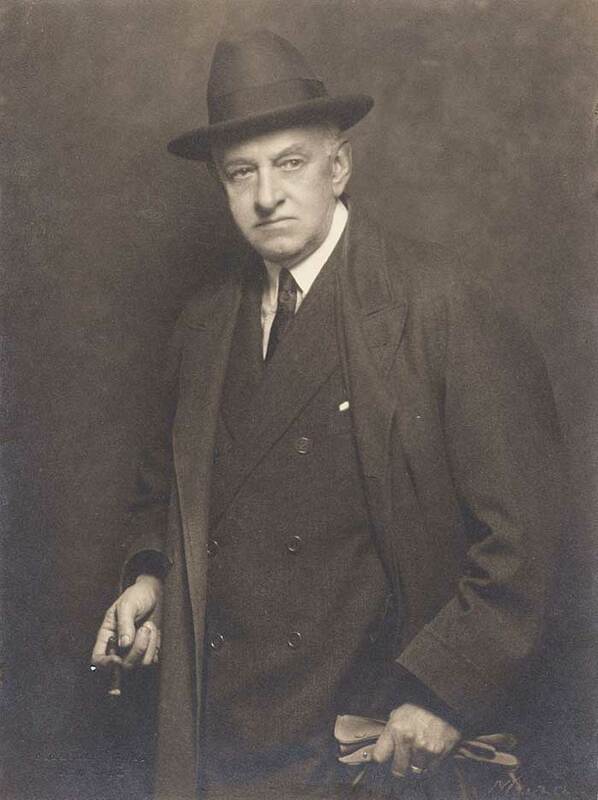 If you want to explore some more of his paintings, you should check out Wiki Art. Thank you for showing these paintings. I love the way he did shadows and the greens. Very informative topic. Thank you Dan for sharing this to us. I particularly admire The Young Lady on the Beach. The limited pallete worked so well to give atmosphere and clarity. The pose of the young lady suggests disappointment and sadness which is totally credible. Would buy this if I could! Thank you for sharing. 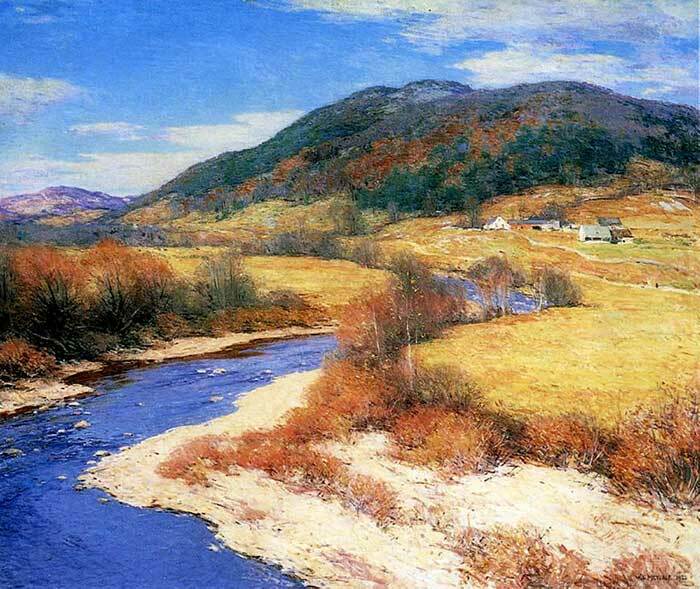 I wasn’t aware of Willard Metcalf or The Ten. I think I like Indian Summer and Swollen Brook, although it is hard to pick. I am appreciating your posts very much as I try to learn this art of oil painting landscapes…. I enjoy reading all your post very much, they are all very inspiring pieces. Thank you very much for sharing these. I particularly like the Dogwood Blossoms, trees were beautifully done with simple brush work & the colours! These are lovely. 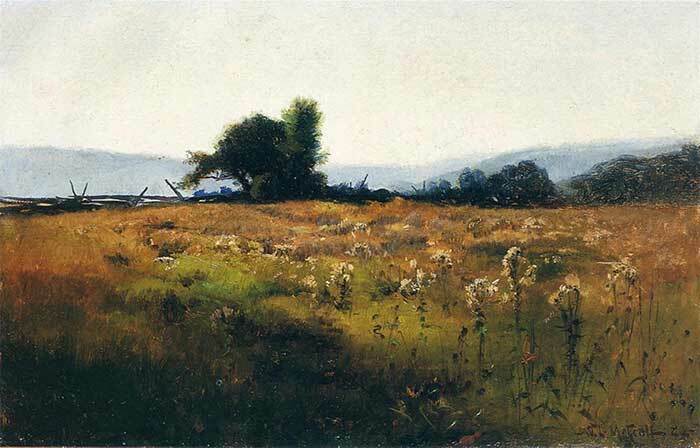 I am not overly familiar with Willard Metcalf’s paintings, but they are quite wonderful. I enjoy reading your descriptions of them, as well. I liked Autumn Festival, Swollen Brook, Dogwoods, etc. They aren’t flashy, but pleasant. All of your posts are very helpful for a rookie such as I am.